Item# 94077 Size: 33.9 fl. oz. Item# 94601 Size: 32 fl. oz. Item# 94700 Size: 128 fl. oz. In Order to Fight Parasites, Repel Flies, Eliminate Odors in Horses / Equines use Health Stall. 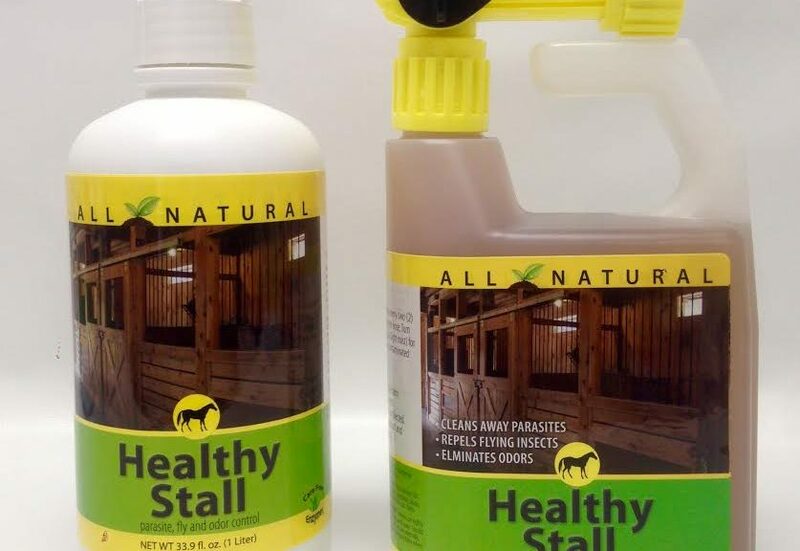 Horse Stalls and barns provide the ideal conditions for parasitic insects such as mites, lice, fleas, flies, ticks, and mosquitoes to live and breed. These insects nest in bedding material and wooden crevices, drink from troughs and rain water, then feed on your horses at night causing discomfort to your animals and the potential for disease. The discomfort caused by these insects can affect the demeanor and long term health of your horses, making them irritable and more difficult to work with. Horse urine and manure is another common problem in stall and barns. The odor from horse urine is obvious and unpleasant but the larger problem is that the fumes carry harmful Ammonia (NH3) which is dangerous to the health of horses and people. Healthy Stall is a perfect 3 in 1 product that provides a clean and natural environment for your horse. 3. Ammonia & Manure: Our natural enzymes safely break down Ammonia (NH3) into harmless and odorless Nitrogen. Healthy Stall also works to break down manure residue which may seep in wooden cracks and horse bedding. Effective & Natural– Healthy Stall is effective against all of these problems, and works to ensure the continued health of your horses. Carefree Enzymes represents that the product qualified for exemption from registration under the 25(b) FIFRA ALL of our products are made with natural enzymes and plant oils without the use of ANY harsh chemicals. When used as directed, they are completely child & animal safe.